XiVA's musicm8 is the easiest entertainment server I've ever installed. To get it up and running took minutes at most. Juiced up and connected to my network via Ethernet, and I was good to go. Having wrestled with servers in the past that literally drove me to distraction with their belligerent non-compliance, this was a relief. 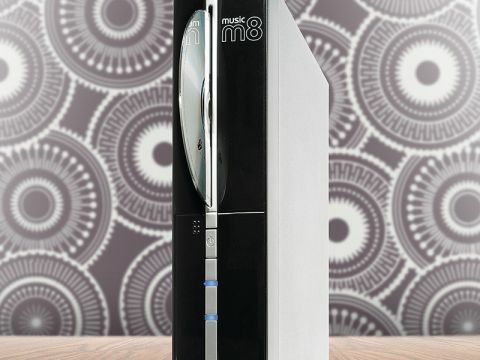 For the uninitiated, the cutely monikered musicm8 ('music mate') is a music server and ripper, a contemporary update on the hardware that first brought maker Imerge to prominence in the '90s. It sits on your network, but is conceived as a living room product. It's neatly turned out, stands vertically or horizontally and has a CD tray to rip discs directly. Significantly, it's very quiet when running. Fully uPnP-compliant, it can stream its music content to a host of compatible devices. Imerge promotes it as a partner for Sonos, Logitech Squeezebox and Linn DS users. I don't have any of that kit (far too posh), but found it immediately recognized by my PS3, Xbox 360, WDTV and Popcorn Hour devices. The unit comes with 1TB of storage, enough for thousands of CDs, and rips without any need to power up a PC. You simply determine the file format it rips to: uncompressed WAV, FLAC or MP3, leaving you to choose a compression level for your usage needs. The CD ripping process takes a few minutes, and then all the tagging is done automatically, with sleeve art pulled from FreeDB and SOAP web services. All of my rips sounded great, and play-out is stutter- and artefact-free. You may choose to store both high-res and compressed versions of your tunes, to service both portable devices and the needs of a decent home system. The folder structure on the musicm8 invites both photo and video storage as well. Dump your video downloads into the appropriate folder and you can stream that content to other networked devices. You can also play tracks from your music collection while browsing photos. Naturally you can manually create your own additional shares for other content. Although it's not possible to install a second drive into the case you can still build some redundancy protection into your musicm8 system by adding an external USB drive. This gives you the option of RAID 1 mirrored protection. Overall, the musicm8 is a delight to use. Painless to setup and widely compatible, it's unlikely even the newest of network users will experience any trouble with it. If I was compiling an additional feature wishlist, it might include things like an integrated BitTorrent client, but that's just a nitpick.